Custom revived: Coddington Mothering Sunday, Nottinghamshire…where it all begun! The origins of Mothering Sunday are little obscure although in the Christian calendar the Sunday of the Golden Rose which dated back to the 11th century. It was believed to date from when communities from satellite churches could pay tribute to the mother church or even communities who rarely made it to church due to their remoteness did so on this date. This then manifested itself as the time when the servants would have the day to visit far off relatives. Various foods became associated with the day, in North in particular, Carlins, a type of pea soaked and then fried in butter was eaten and a cake Simnel cake was baked. Over the years, the religious aspects of the custom, as a result of the Reformation, disappeared and the secular observation slipped away similarly. Keep Mum! Mothering Sunday and Mother’s day are not the same! It may not be wise to mention it but every year there are two days which celebrate mothers and two card giving days. The Americans were first. However, it is Constance Penswick Smith that we can thank for the modern revival, for it was whilst reading an article in the Evening news of a lady in Philidelphia was thinking down similar lines. This was in 1906, Miss Anna Jarvis created a secular tradition, set down for the second weekend in May where Mothers were celebrated. It is thought that like Hallowe’en and Valentine’s day, the Stateside Mother’s day was also imported by servicemen in the 1940s and this coincided with the church’s attempt to revitalise the custom. Setting up headquarters at 15 Regent Street Nottingham, she and a friend Ellen worked tireless to get the ceremony re-established, even designing cards, collected appropriate hymns and approached the Mother’s Union who were keen but thought the custom too long dead to be revived. She published a book in 1921 and from this the idea spread. First locally, when the Reverend Killer of St Cyprians Nottingham and when the new church was consecrated in 1936, mothering Sunday became an annual event and then using her four brothers, who took holy orders, introduced the service into their churches. By the end of the Second World War, the amalgamation of the two customs had become entrenched and despite a few cards which proclaim the correct name, they are generally inseparable as names now especially since the 1950s when merchants realized the commercial potential! One of the most important places to celebrate the day must of course be where it was first revived. Coddington’s Mothering Sunday service is like everywhere a very popular service, but here there is perhaps more of an appreciation. 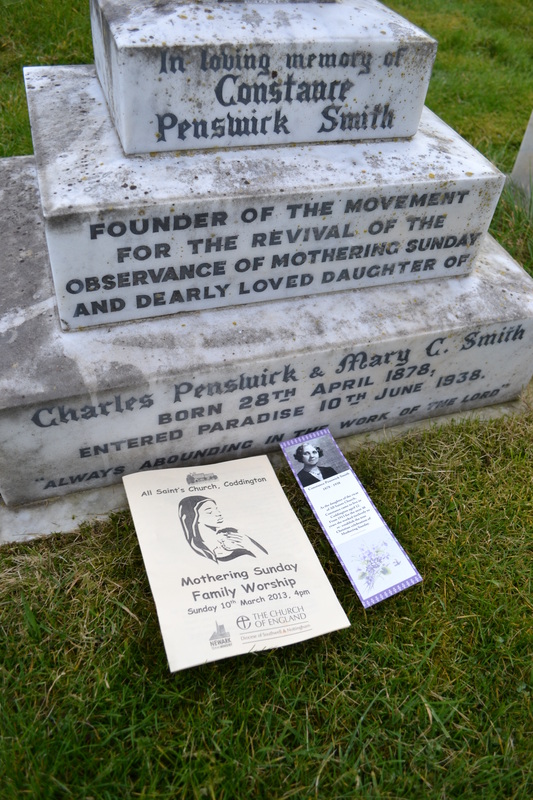 So in 2013, on Sunday the 10th March, the parish church of Coddington in Nottinghamshire celebrated the 100th anniversary of the re-foundation of Mothering Sunday by Constance Smith. A different clyp ‘round the ear! The church service led by the Rev William Thackrey and the curate Rev. David Anderson and notable features of the service was the delightful touching tribute to mothers made by the children of Coddington primary school, and then their clyping of the church. This is done in a number of churches, including some Nottinghamshire churches, although usually this is done outside, the horrendous wintry weather meant it was more sensible to clyp the inside of the church. The origins of this custom are obscure but it is associated with Mothering Sunday in Staplehurst in Kent. Some authorities have tried to link the custom to pagan origins but certainly the idea of embracing the mother church is wholly appropriate to the theme of the celebration. Whilst clyping a special hymn ‘We love the place O Lord’ was sung to recognise the importance of the church. 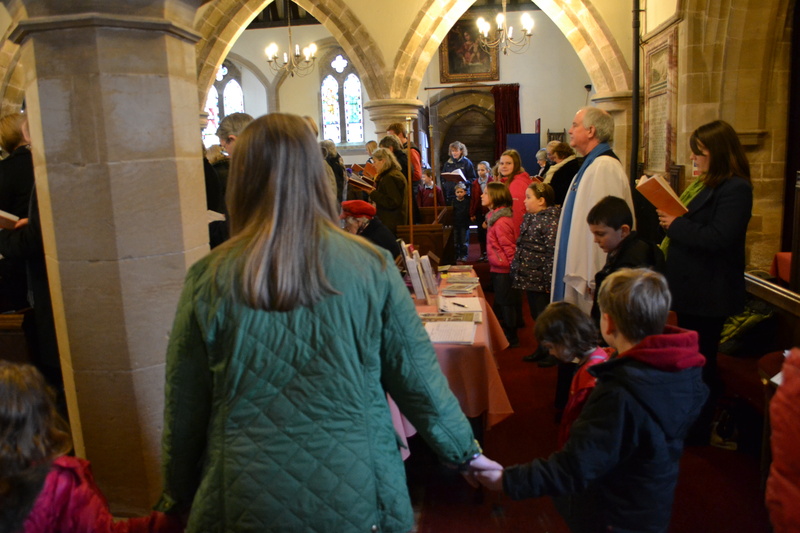 The children in this circle then processed through the vestry and into the chancel where the vicar and curate awaited holding trays of primroses; free gifts for their mothers. 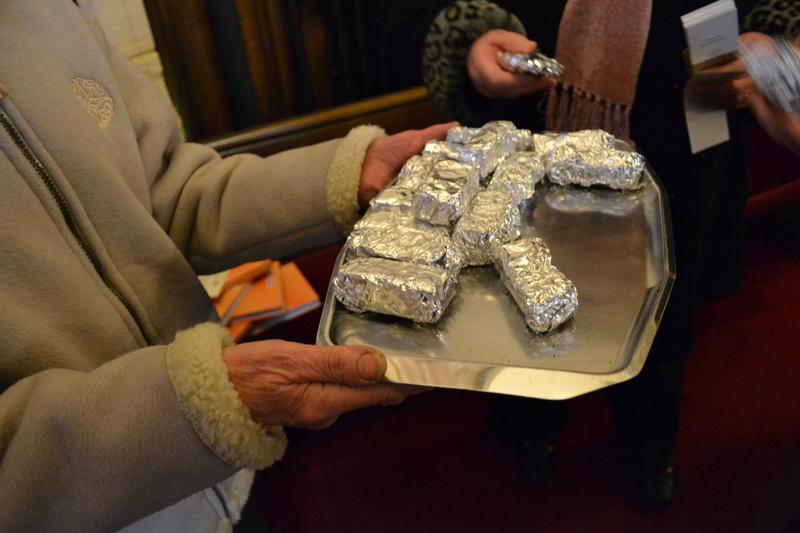 With a final hymn and blessing the congregation were given a bookmark commemorating Constance Smith and Simnel cake. This is of course an old food traditionally associated with the custom of Mothering Sunday. Its creation put down to an argument between Sim and Nell how to cook it; one boiling and one baking. Some people don’t like it but it always reminds me of my mum’s cakes which I suppose is the point. A hundred years on from the thought, Mothering Sunday in its religious and secular guise is with us as long as we need to appreciate mothers…and sell cards no doubt!